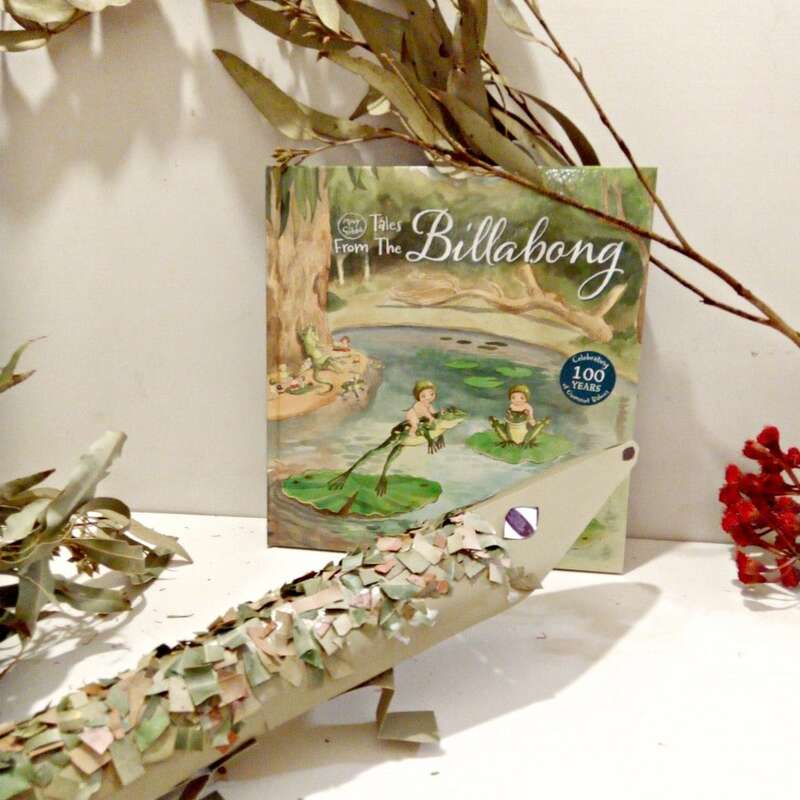 To celebrate 100 years of Snugglepot and Cuddlepie we’ve made an Australian animal craft project of May Gibbs’ favourite reptile, the loyal and suave Mr Lizard! 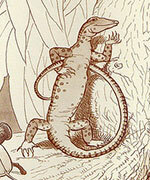 Mr Lizard is a Goanna and one of the regular characters in the May Gibbs stories. 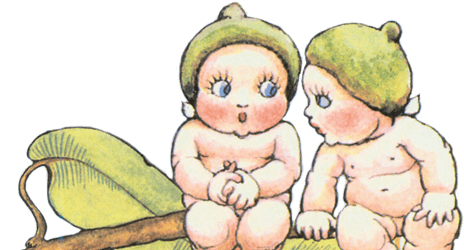 He is friends to the Nuts and Blossoms and is often saving them from uncertainty. Mr Lizard is strong and fast and one of our favourite characters. Take a piece of your green card and fold it horizontally in half. With the folded part closest and the edges facing away draw a line with the ruler from top to bottom corner diagonally like shown. 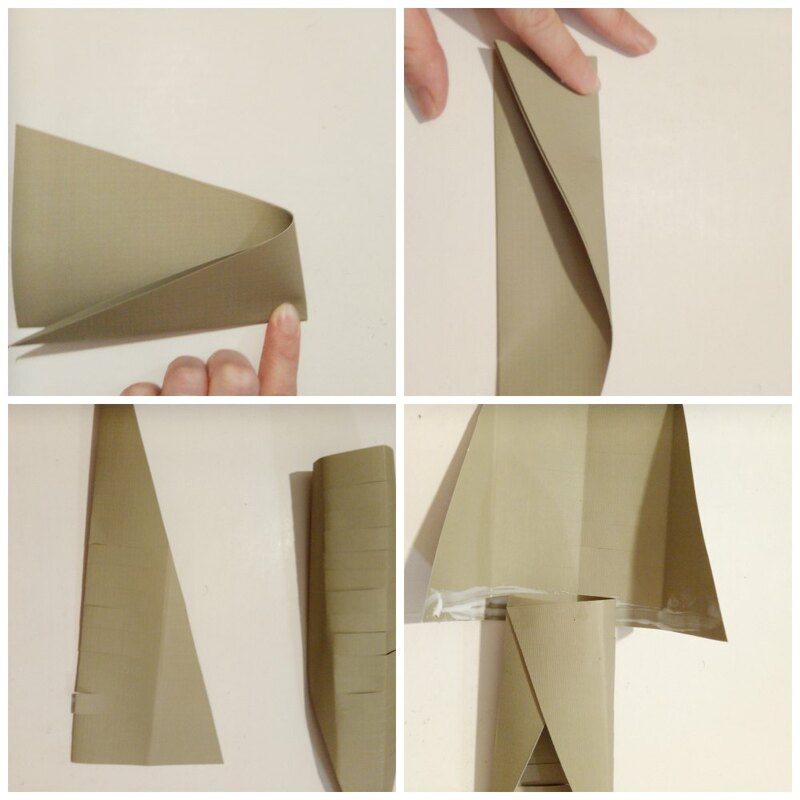 Then cut along the line so you have a folded triangular shape. Save those cut off parts you’ll need those later. 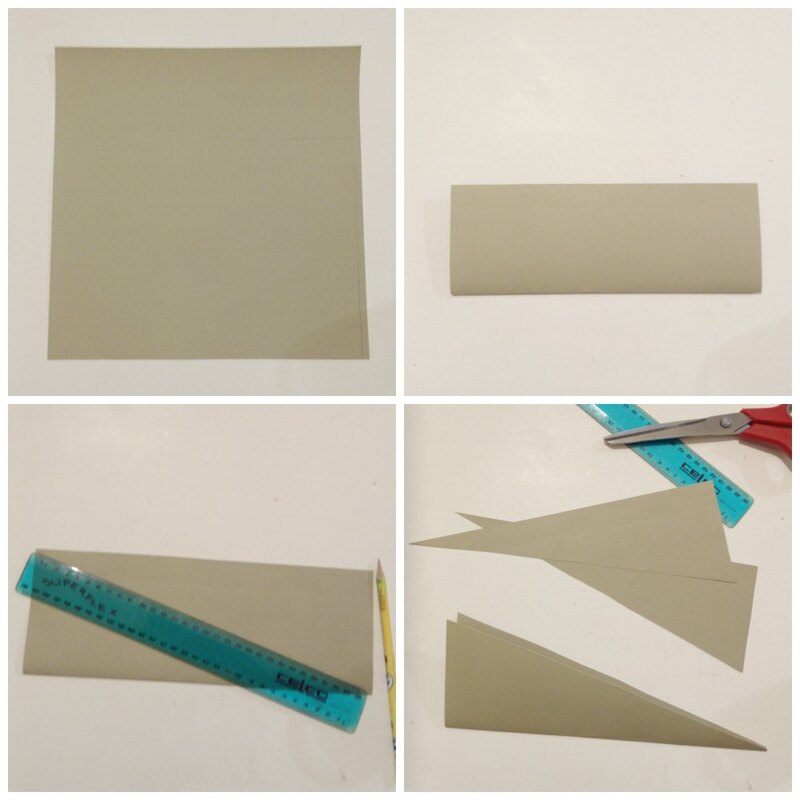 With your folded triangular shape, crease the top corner as shown down to the bottom so you get a crease mark like shown. Now using your scissors make a small slit cuts along the long folded edge. Be sure not to cut the whole way through at any point. 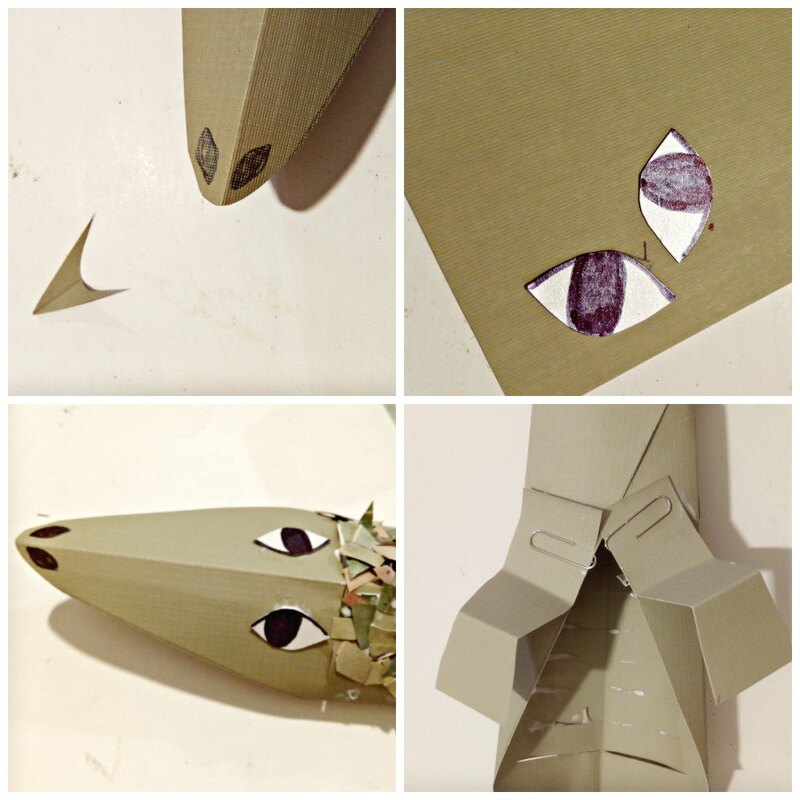 Now open up your folded triangle and you will see a larger triangle shape with cuts along the middle. 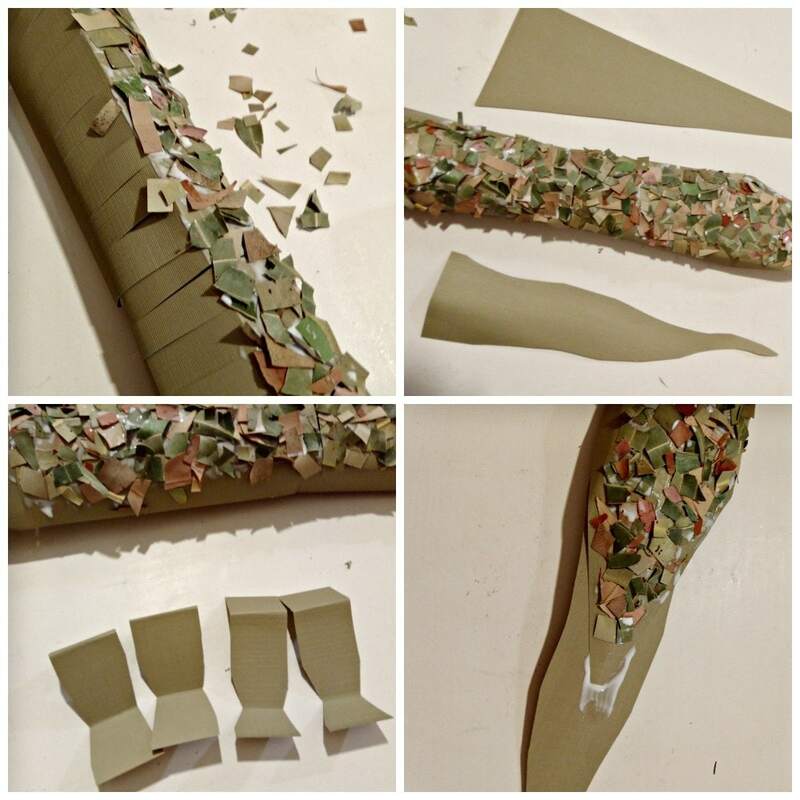 The two wing parts where you creased can now be folded up and glued down as shown. This is your lizard body. Using your second sheet of card follow step 1. 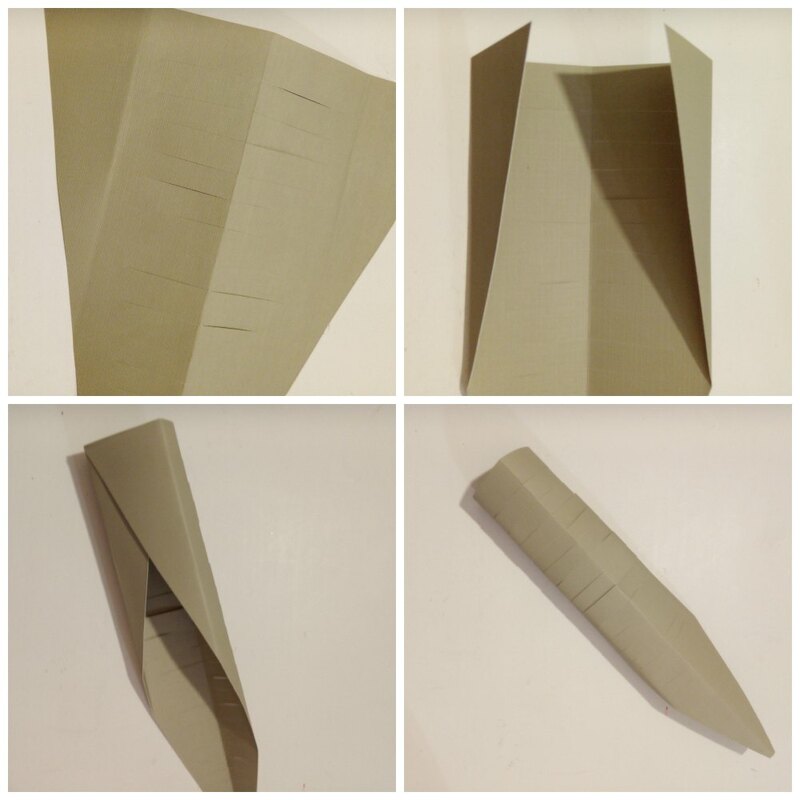 Once you have the triangular shape, crease the longest edge from tip to corner as shown then open up. Then repeat the top to bottom creasing as you did in step 2. 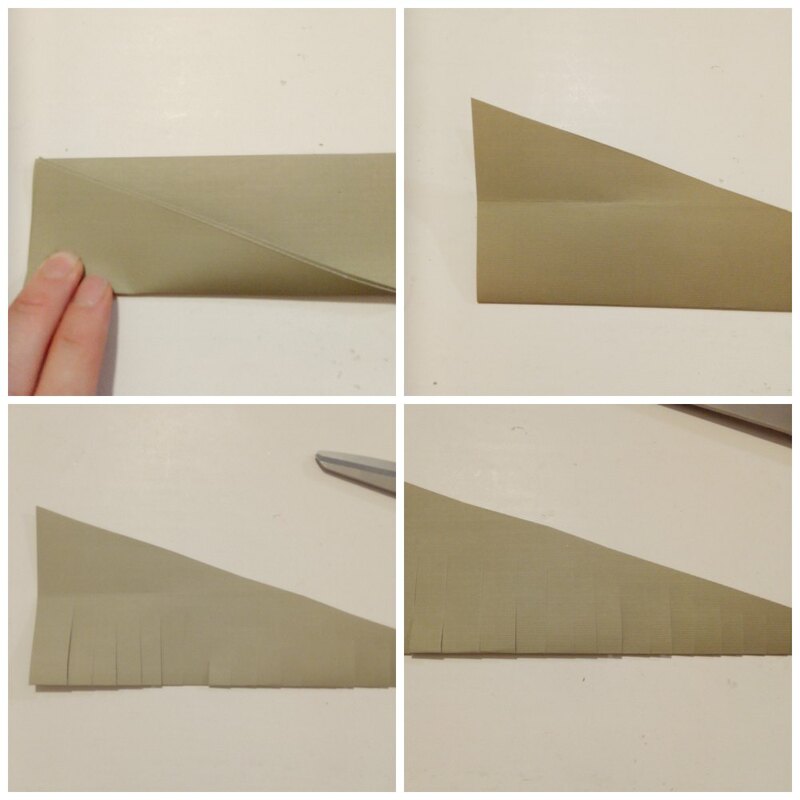 This time when you cut only go to the halfway mark you made along your folded long edge. So only cuts small slits about halfway along. Now open to the large triangle like step 3. This time you want to glue this part together around your lizard body part. So now you have two parts glued together. The first part has slits cut all the way along the second part only halfway. The halfaway part is your Mr Lizard head. 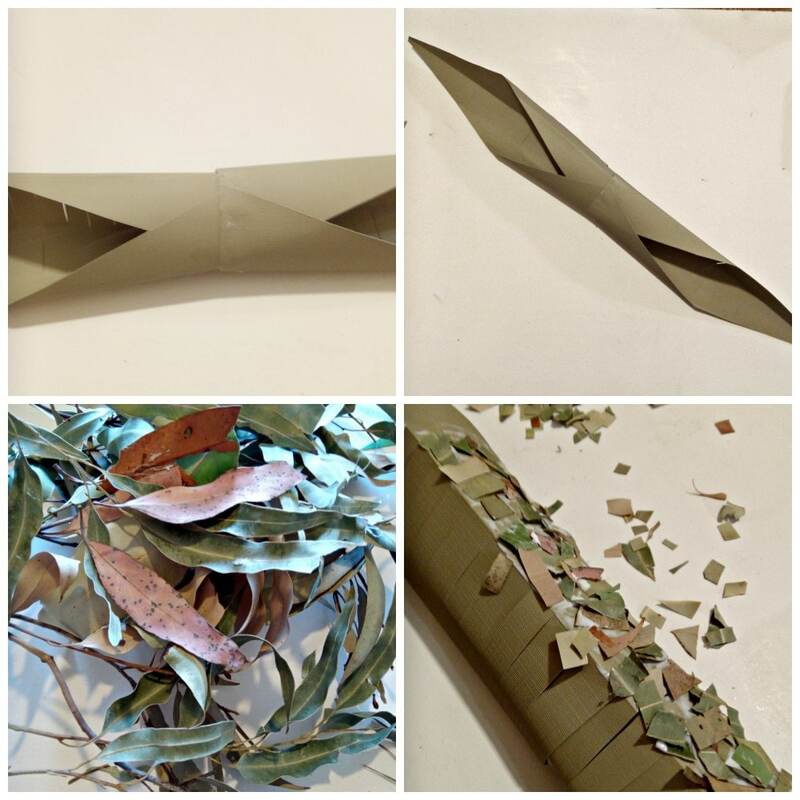 Here we cut up our dried gum leaves into small pieces to become Mr Lizard’s scales. We simply painted PVA on with a brush and stuck them all over his back. Whilst you are waiting for the body to dry now is the time you bring back that card that we cut off in step 1. 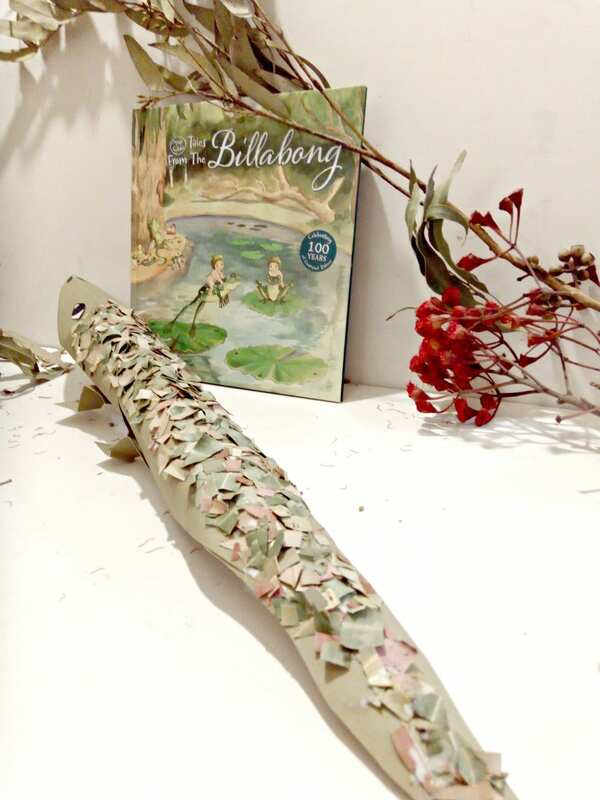 First we cut one into a long tail shape, Mr Lizard is a goanna and has a long tail so we extended the body part with his tail by PVA gluing it in and then gluing more small leaf scales down the tail. Next we cut some legs and feet from the other leftover card. We ended up reinforcing our legs to hold up the body weight with more leftover card, I think that would be easier to do here not after like us. Just double up the width of the card if required. Mr Lizard needs a face so we trimmed his now and added some nostrils. Then using your small white card we drew some eyes, cut the out and glued them on. Then to finish we turned him over and glued on his legs. We secured them with PVA till they were dry. Mr Lizard is complete. I love the colours and shades of his scales. This was a great way to practise cutting great for fine motor skills. 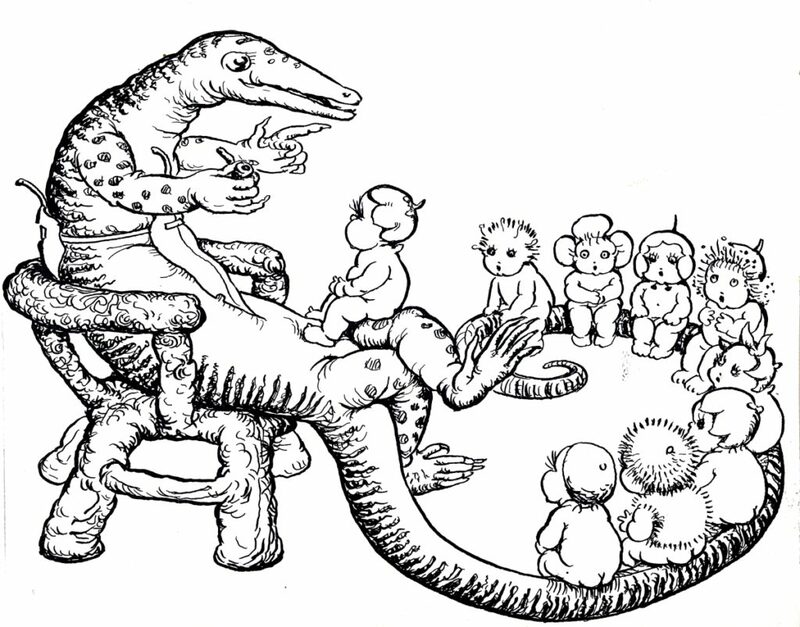 Mr Lizard is a lovely addition to our storytelling time. « The Lost Art of Letter Writing – Encouraging Kids to Spark a Love of Letters!